Railtel Corporation of India Ltd Recruitment 2015: The Railtel Corporation of India Limited has been announced the notification for the recruitment of 50 posts such as District Manage, Project Manager, Technician, Help Desk Support Engineer, Customer Relationship Manager, NOC Manager, HR, Admin, District coordinator and etc. Eligible and interested candidates apply for the job recruitment to download the application form at the official site. The candidates have to fill the application form in the prescribed format along the educational qualification certificate copy before the last date of application submission. More details like as the age, qualification, selection process, how to apply the recruitment details given below. 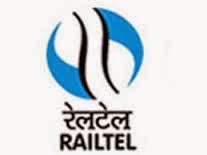 Name of the Corporation - Railtel Corporation of India Limited. Candidates should possess the BSC/BE/BTECH in any stream Computer Science, Information Technology, Electrical, Electronics and Communication for the project manager post. The candidates have the trade certificate from the Government ITI in the Telecommunication, Electronics, B.E Electronics for the service desk manager. If you want to know more details about the recruitment and then take look at the notification given here. The candidate selection process is based upon the performance in the written test and then shortlisted candidates called for the personal interview. The candidates download the application from the official site and fill the form in the prescribed format along with relevant documents send to the proper address earlier of the application last date.